In large internetworks, hundreds or even thousands of network addresses can exist. In these environments, it is often not desirable for routers to maintain many routes in their routing table. Route summarization, also called route aggregation or supernetting, can reduce the number of routes that a router must maintain by representing a series of network numbers in a single summary address. This section describes and provides examples of route summarization, including implementation considerations. Figure 3-33 shows that Router A can either send three routing update entries or summarize the addresses into a single network number. I can route to the 172.16.0.0/16 network. The figure illustrates a summary route based on a full octet: 172.16.25.0/24, 172.16.26.0/24, and 172.16.27.0/24 could be summarized into 172.16.0.0/16. NOTE Router A can route to network 172.16.0.0/16, including all subnets of that network. However, if there were other subnets of 172.16.0.0 elsewhere in the network (for example, if 172.16.0.0 were discontiguous), summarizing in this way might not be valid. Discontiguous networks and summarization are discussed later in this chapter. Another advantage to using route summarization in a large, complex network is that it can isolate topology changes from other routers. That is, if a specific link in the 172.16.27.0/24 domain were "flapping," or going up and down rapidly, the summary route would not change. Therefore, no router external to the domain would need to keep modifying its routing table due to this flapping activity. By summarizing addresses, you also reduce the amount of memory consumed by the routing protocol for table entries. Route summarization is most effective within a subnetted environment when the network addresses are in contiguous blocks in powers of two. For example, 4, 16, or 512 addresses can be represented by a single routing entry because summary masks are binary masks—just like subnet masks—so summarization must take place on binary boundaries (powers of two). Routing protocols summarize or aggregate routes based on shared network numbers within the network. Classless routing protocols, such as RIP-2, OSPF, IS-IS, and EIGRP, support route summarization based on subnet addresses, including VLSM addressing. Classful routing protocols, such as RIP-1 and IGRP, automatically summarize routes on the classful network boundary and do not support summarization on any other boundaries. RFC 1518, "An Architecture for IP Address Allocation with CIDR," describes summarization in full detail. To determine the summary route, the router determines the number of highest-order bits that match in all the addresses. By converting the IP addresses to the binary format, as shown in Figure 3-34, you can determine the number of common bits shared among the IP addresses. In Figure 3-34, the first 21 bits are in common among the IP addresses. Therefore, the best summary route is 172.16.168.0/21. You can summarize addresses when the number of addresses is a power of two. If the number of addresses is not a power of two, you can divide the addresses into groups and summarize the groups separately. To allow the router to aggregate the highest number of IP addresses into a single route summary, your IP addressing plan should be hierarchical in nature. This approach is particularly important when using VLSMs. A VLSM design allows for maximum use of IP addresses, as well as more efficient routing update communication when using hierarchical IP addressing. In Figure 3-35, for example, route summarization occurs at two levels. ■ Router C summarizes two routing updates from networks 172.16.32.64/26 and 172.16.32.128/26 into a single update, 172.16.32.0/24. ■ Router A receives three different routing updates but summarizes them into a single routing update before propagating it to the corporate network. Route summarization reduces memory use on routers and routing protocol network traffic. 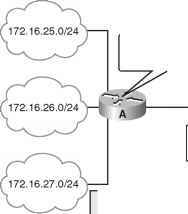 ■ Multiple IP addresses must share the same highest-order bits. ■ Routing protocols must base their routing decisions on a 32-bit IP address and a prefix length that can be up to 32 bits. ■ Routing protocols must carry the prefix length (subnet mask) with the 32-bit IP address. ■ Sending route summaries: Routing protocols, such as RIP and EIGRP, perform automatic route summarization across network boundaries. Specifically, this automatic summarization occurs for those routes whose classful network address differs from the major network address of the interface to which the advertisement is being sent. For OSPF and IS-IS, you must configure manual summarization. For EIGRP and RIP-2, you can disable automatic route summarization and configure manual summarization. Whether routing summarization is automatic or not depends on the routing protocol. It is recommended that you review the documentation for your specific routing protocols. Route summarization is not always a solution. You would not use route summarization if you needed to advertise all networks across a boundary, such as when you have discontiguous networks. ■ Selecting routes from route summaries: If more than one entry in the routing table matches a particular destination, the longest prefix match in the routing table is used. Several routes might match one destination, but the longest matching prefix is used. For example, if a routing table has different paths to 192.16.0.0/16 and to 192.16.5.0/24, packets addressed to 192.16.5.99 would be routed through the 192.16.5.0/24 path because that address has the longest match with the destination address. ■ Subnets are not advertised to a different major network. ■ Discontiguous subnets are not visible to each other. In Figure 3-36, RIP-1 does not advertise the 172.16.5.0 255.255.255.0 and 172.16.6.0 255.255.255.0 subnets because RIPv1 cannot advertise subnets; both Router A and Router B advertise 172.16.0.0. 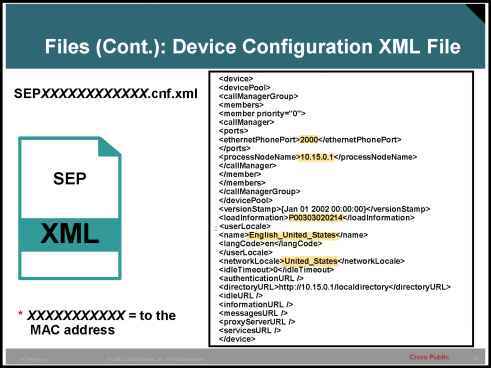 This leads to confusion when routing across network 192.168.14.0. In this example, Router C receives routes about 172.16.0.0 from two different directions, so it cannot make a correct routing decision. NOTE Cisco IOS Software also provides an IP unnumbered feature that permits discontiguous subnets to be separated by an unnumbered link. What is the best summarization for these routes 172.16.0.0? Are there disadvantages to vlsm and route summarization?